Here is another one of my mum's recipes she has shared with me. This is very popular with my family and friends. The aromas you get around the house while this is cooking is lovely. For anyone that loves cuttlefish, you should give it a try. Once the risotto is done, the cuttlefish will still have a bit of bite to it, it isn't super soft, but it is very tasty. Surprisingly my kids love it to, I say surprisingly as lots of kids won't even try things. I find starting them early on new foods makes everything normal. My 6 year old is a big foodie, and devours this. Nothing is too hot or spicy for him, nothing disgusts him. He is driven by flavour alone and will try anything. He makes me laugh, eating gives him such joy, quite funny. Now I've noted that you need 1.5kg cleaned cuttlefish. We have a great friend who goes fishing and brings us cuttlefish, which is just amazing for us. The cuttlefish are usually really big. So I put them in two freezer bags, body in one, tentacles in the other, then freeze them until I need them. 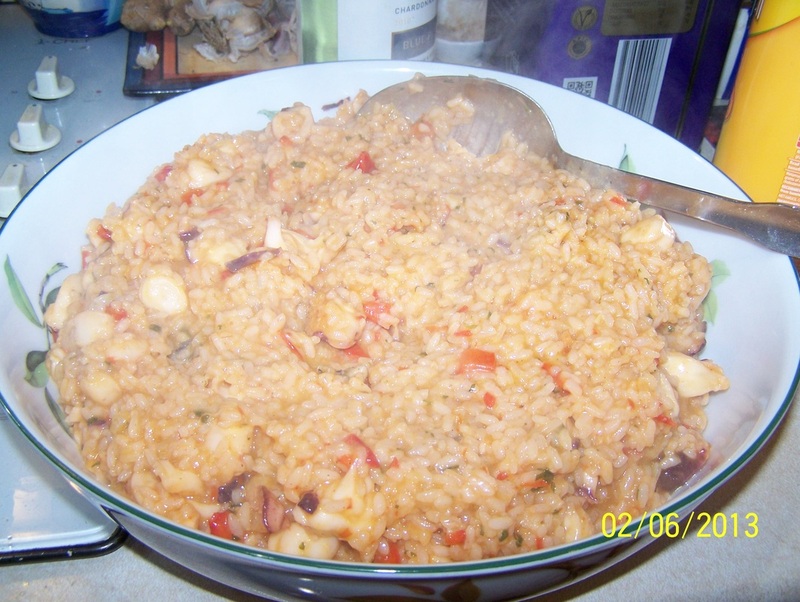 The risotto I make could be 1.5kg of tentacles only or just the bodies. If buying from the fish shop, use smaller one and use the whole lot in the risotto. I have added Ajvar to the recipe, which is a Croatian Vegetable relish. If you decide to use it, the leftover relish is lovely on sandwiches. If you prefer not to buy it, just add an extra tablespoon of tomato paste. With the water I have added the measure as, 'as needed'. What I do is I boil up water in my kettle. Then after the wine has been added, and absorbed into the rice, I add 1/2-3/4 cup water, just enough water to cover the rice, then allow that to absorb into the rice, then I keep adding water and allowing it to absorb, until the rice is cooked to my liking, it takes about 20 minutes, stirring constantly. Vegeta is a vegetable stock powder, use it to taste, if you need more add more, if you want less, add less. Place your cleaned cuttlefish into a large saucepan. Fill it with cold tap water to cover the cuttlefish completely. Bring to the boil over high heat. Once it comes to the boil, simmer for 2 minutes, then turn off the heat, leave the cuttlefish to sit in the water for 20 minutes. After 20 minutes has passed, drain away the water, roughly dice up the cuttlefish. Add oil to a large saucepan over medium heat. Add the onion, sauté for 5 minutes. Add the capsicum, sauté for 3 minutes then add the garlic, chilli and parsley, sauté for another 2 minutes. Add your diced cuttlefish, stirring, regularly, sauté for 10 minutes. Add the rice, give it a stir. Add the ajvar and tomato paste, give it a stir. Then add the wine, allow it simmer away and be absorbed by the rice. Add in the bay leaf. Add your first 1/2-3/4 cup of boiling water, stir it through the rice, it should just cover the rice. Season with salt and pepper, add the vegeta, start with 2 teaspoons of vegeta, you can always add more if needed. Allow the water to nearly disappear into the rice before adding your next lot of water. This whole process takes about 20 minutes, don't leave the pot it can burn easily. Repeat adding water, allowing it absorb, until you feel the rice is cooked to your liking. Keep tasting the liquid for seasoning, adding more if needed. Serve immediately.